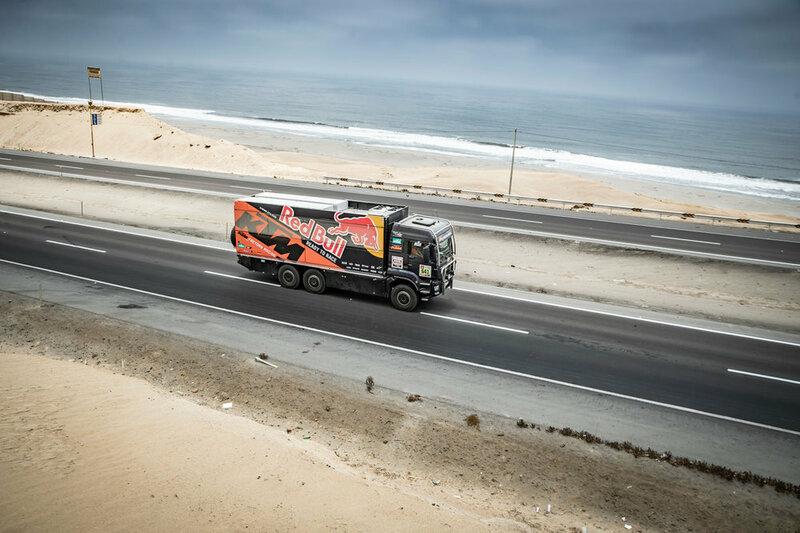 They came to Lima to take care of riders, team, trucks, motorhomes, and KTM customers. 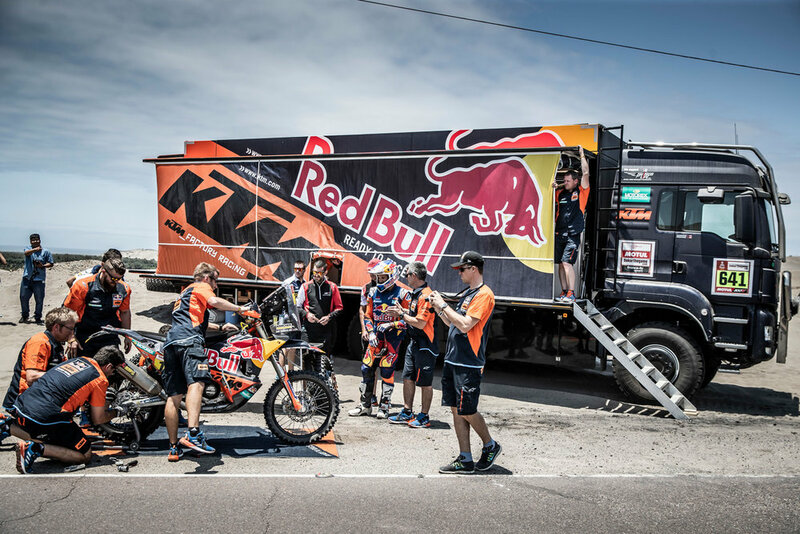 How did they join KTM´s Dakar operation, and what are their roles? How was it once upon a time in Africa, what has changed, what has remained exactly the same, and what’s love got to do with it? Everything! “This is the third Dakar of my life,”says Tom, preparing the motorhome for Hiasi, nickname for Matthias, and Luciano, the two riders sharing the Dakar home for 10 days. “I’ve known Hiasi for a very long time. We met on the motocross track, where else? We love the same sport, but he is obviously from a different league. I started late, but still competed on national level. Well, occasionally I still put on my riding gear if I am not doing up some old car,”laughs the 34-year-old IT specialist from Salzburg. His story of how he became a mechanic specialized for hard cases, is full of wisdom and therefore, worth sharing. “I was 19 and I´d just bought my first car. It was an old Audi Quattro, with some issues, of course. I took it to the workshop where they were supposed to repair it, but I wasn’t happy with the work done. And even less pleased with the huge amount of money they wanted from me! I was discussing it with the workshop owner, trying to negotiate and lower the price, because I didn’t want to pay for their mistake, when the owner had enough and said to me: ‘Ok, go, but if you don’t like our work, you will have to do it on your own.’ And I did it. Years later, I was thinking about what he said to me and realized how valuable that was. It gave me the power to think that nothing is too difficult for me, and that I can learn all by myself,” remembers Tom. So, he did repair his car. He repaired other people’s cars, mostly old ones with complicated issues. He even built himself a racecar. And all that knowledge brought him all the way to rally sport. For his first race, he prepared during the flight. “I had 40, 50 pages of car instructions and the flight was long enough to study them,”laughs Tom, but admits it was no walk in the park; rally cars are super expensive and you need to be very precise. Miquel’s Dakar journey begins on the Lisboa-Dakar route in 2006. He was 23 when the invitation arrived, and caught him eager to explore the Dark Continent. He comes from the same village as the Dakar legend Marc Coma, so the path to the rally was a short one. When the nights are extremely short, Miquel sleeps on the truck, under the stars. When the nights are a bit longer, he might put up the tent. Sometimes, during the night, he would also become nostalgic. Speaking of the joy of being part of the orange family, during the rally expeditions he misses his own. “Sure I want to be a good dad, but it’s not easy with this job. We are away a lot, and this is the major downside. My son is almost three years old and starts to feel my absence.”It’s not the best consolation, but to live your life with two families?